This appears to be an intermittent error that occurs at times of high workload for Turnitin and currently the advice is to try the upload again at a later time. The Digital Education Office are in touch with Turnitin about the error and will update this blog with any further information. 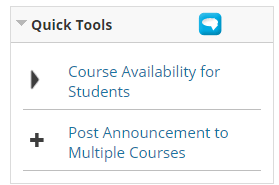 As an Instructor, if under “My Courses” on your Blackboard home page you see “not currently available” or “unavailable” after the course name, this means the course is unavailable to students. Instructors can still access and edit the course. You can use the Quick Tools on your Blackboard Home page. Click Course Availability and turn the On/Off button next to the course to the required state. Blackboard service interruption, Friday, December 28th, 2018 1:00 a.m – 5:00 a.m. Blackboard are performing scheduled maintenance on their data servers on Friday December 28th between 1 a.m. and 5 a.m. which will result in a loss of service for this time. The “Quick tools” feature (pictured below) will be temporarily unavailable between 1:00 pm on 3 January and 12:00 noon 4 January. This is to allow us to update the tool. No other features of Blackboard are affected. This announcement is for staff who use Questionmark. We have been informed by Questionmark that they will no longer provide support for the University’s current version, Perception 5.7, after July 2019. This means that we will need to upgrade our service before 31st July 2019.